Ana* says she always dreamed of being a mother. But, when she got pregnant at 21 while still in college, she knew it was not the right time to become a parent. “I simply didn’t want to bring a child into the world without me being ready to offer them everything they deserve,” Ana, now 25, told Refinery29. Though Ana had a relatively easy time obtaining an abortion four years ago, for young women on the island in similar situations, it may not be that simple going forward. Puerto Rico’s local laws ban abortion, but after the U.S. Supreme Court’s decision on Roe v. Wade in 1973, those became unenforceable. (Puerto Rico has been a territory of the United States since 1898 and decisions such as Roe, which legalized abortion in the U.S., apply to the island even if it’s not a state.) As of now, the Puerto Rican government allows abortions at any point of the pregnancy as long as they’re offered by one of the few licensed providers in the island. PS950 aimed to change that. The legislation was authored by Sen. Nayda Venegas Brown, a pro-statehood lawmaker and evangelical minister. The original bill introduced a series of restrictions including a 48-hour waiting period, a ban on abortions after 20 weeks of gestation, and a sentence of up to 15 years of prison for providers who violated the law — in line with the wave of anti-abortion legislation that has swept states in recent years. 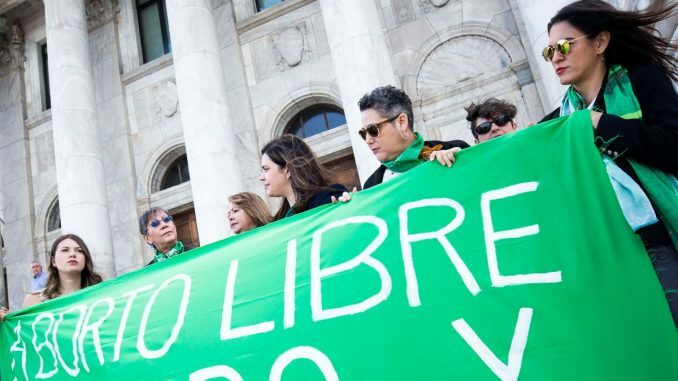 While the bill that passed does away with many of the original restrictions, Dr. Vale Moreno said she’s concerned the effort is just the beginning of the fight over reproductive rights in Puerto Rico. “The measure amending the Civil Code says that a fetus has the same rights as a person,” she said in reference to legislation that passed the Senate on Wednesday. “That’s the foundation for new legislation and legal challenges [related to abortion] under the presumption that it would violate the new Civil Code.” Her fears were confirmed by Venegas Brown, who during debate of PS950 told the Senate chamber: “I wish this was a bill to ban abortion,” before adding that’s not possible due to Roe. She concluded her turn implying this will be the first of other anti-choice measures. The idea of making abortion harder to access in Puerto Rico has rattled some of the women who’ve terminated their pregnancies in the island. Karla* was not ready to be a mother — far from it. When she found herself pregnant three years ago at the age of 27, she was in a tumultuous relationship, without health insurance, and not in a financially stable position. “I wasn’t ready for a kid,” she told Refinery29. “[Becoming a parent] ] was not viable. It was never an option.” She was around eight weeks along when she terminated her pregnancy and the process was pretty much seamless. “I just Googled it and found a clinic. I made an appointment and two weeks later, it was over,” she said. She was terrified of facing anti-abortion protesters outside the clinic, but that didn’t materialize. Once she got to the clinic the day of her appointment, she was out in 30 minutes. Her dilation and evacuation — a type of surgical abortion — cost her around $300. The most recent research on abortion rates in Puerto Rico dates back to 1999. At the time, researchers said that about 23 out of every 1,000 pregnancies were terminated in Puerto Rico — which means the island’s abortion rates were lower than other places in the world with similar non-restrictive laws, which were estimated to be 35 out of every 1,000. One of the reasons is the how conservative and religious society is in the territory: “In Puerto Rico, abortion and the concept of choice are not part of our culture,” Alexandra-Marie Figueroa Miranda, campaign and activism coordinator with Amnesty International Puerto Rico, told Refinery29. Amnesty have strongly opposed PS950 alongside other major groups such ACLU Puerto Rico and International Planned Parenthood Federation, the feminist organization Colectiva Feminista en Construcción, the women’s healthcare group Taller Salud, and many more. Organizers also denounced that Thursday’s hearing and vote were closed off to the public, in direct violation of Article 3, Section 11 of the Commonwealth of Puerto Rico’s Constitution. A major concern for reproductive rights advocates is the diminishing number of abortion providers on the island. Vale Moreno said that back in the 1990s, Puerto Rico had over a dozen of clinics. Now there are only six clinics — and half of them are managed by providers who are over 70-years-old. (Overall, there’s a crisis over the access to healthcare services on the island: According to a 2016 report by the Health Resources and Services Administration, more than 19,000 Puerto Ricans live “healthcare provider shortage areas.”) Puerto Rico has also served as sort-of an abortion haven for other Caribbean women, Vale Moreno said. Some of her patients have traveled from the nearby islands of St. Thomas and St. Croix for abortion care, because there are no clinics that offer services after the first trimester. Vale Moreno and other providers have also attended patients from the neighboring Dominican Republic, where abortion remains illegal. The implementation of anti-abortion legislation on Puerto Rico would impact these women too. *Names have been changed to protect the source’s identity. This story was originally published on March 7, 2019. It has since been updated with new information.